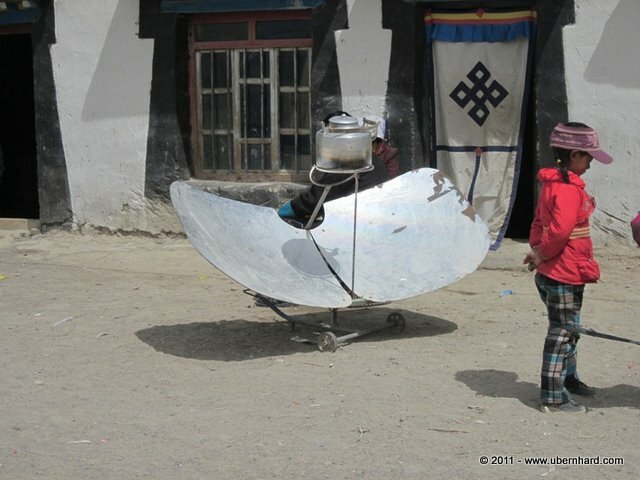 We left Nyalam in our mini bus on April 12 around 8:30am local time and drove deeper and higher into Tibet. It was a beautiful drive across a dry high altitude valley where we passed a few Tibetan farmer villages with their characteristic architecture. The ground is very dry here and life is hard at this altitude. Our bus climbed higher and higher on a curvy road until we arrived at the top of the Thong La pass which was at over 5,153m/17,005ft altitude. We made a short stop at the top and enjoyed the great view. 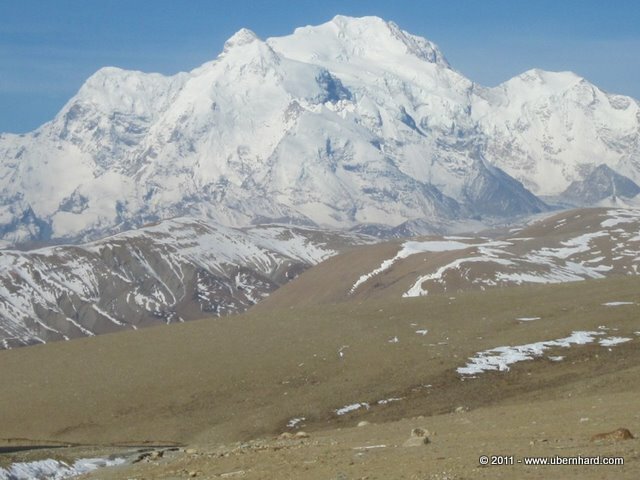 From here, we observed many beautiful Himalayan peaks and once again, had a great view of Shishapangma. 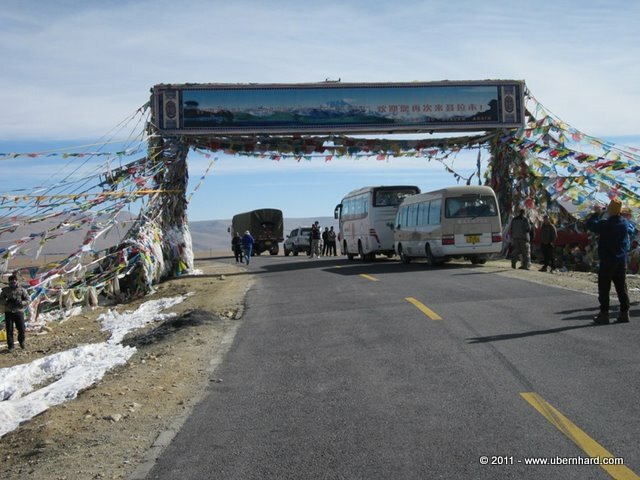 On the way down, on the other side of the pass, we entered the Tibetan High Plateau which looked like a dry high desert to me. 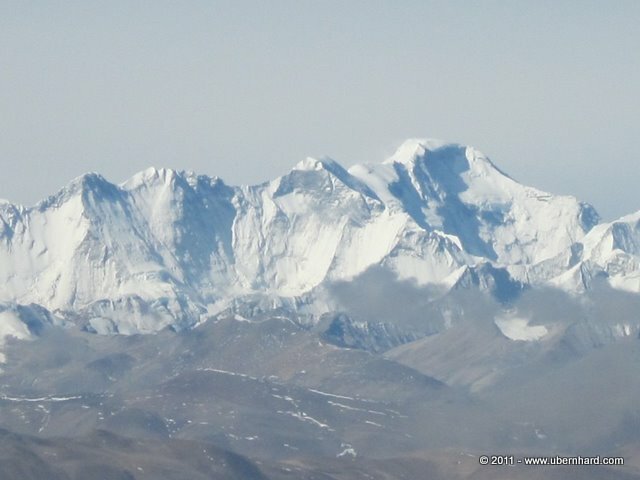 Suddenly, in a distance, we got the first view of Everest and Cho Oyu, the sixth highest mountain in the world. It was a great moment to so see our climbing goal Everest straight ahead of us in all its glory! After about a four-hour drive we finally arrived in the town of Thingri, at 4,300m/14,100ft. We checked into the “Ha Hoo” Hotel and shortly after started to explore the town. 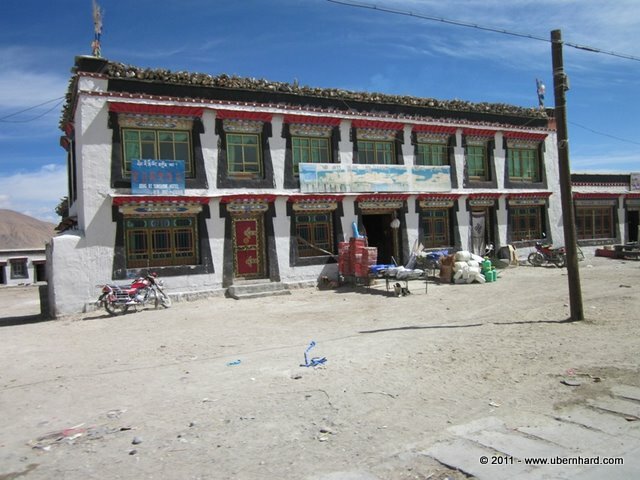 Thingri is a real Tibetan town at a very high altitude and I really enjoyed exploring the streets and shops and meeting the local people. Later we had dinner together with a group of six individual climbers which are sharing the climbing permit with us. Once again, I enjoyed very much the Chinese food we received that evening. The next morning, on April 13, Jim and I hiked up two nearby “hills”. 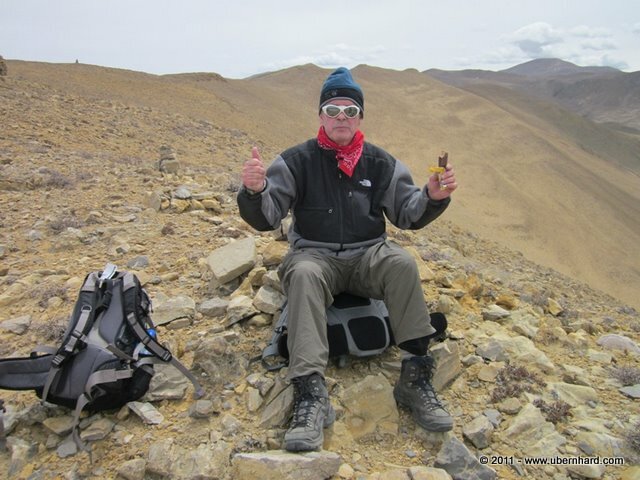 The first one was at about 4,600m/15,200ft and the second one at 5,000m/16,500ft. 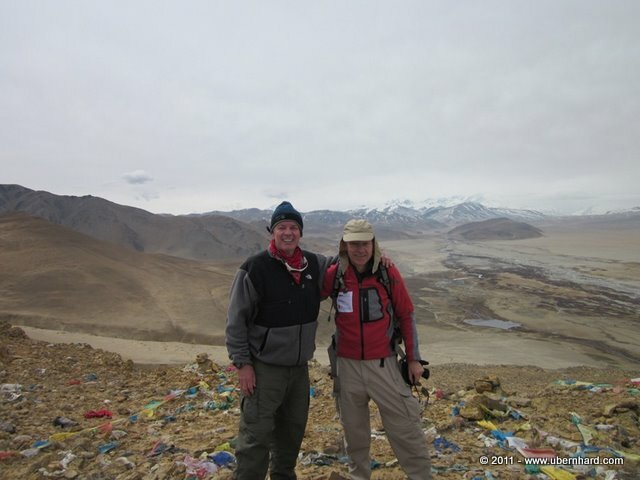 These were great acclimatization hikes and both of us enjoyed the climb and the great view form up there. Once again we saw Everest and Cho Oyo in a distance. It was a good feeling to be out in the nature and we both are ready to move on to the next phase: Everest Base Camp. In the afternoon we did our last shopping, mostly water and some sweets, and relaxed for the rest of the day. In the evening, after an excellent Chinese dinner we moved in our rooms and enjoyed the last night in real beds, knowing that we will spend the next 50+ days in a tent. 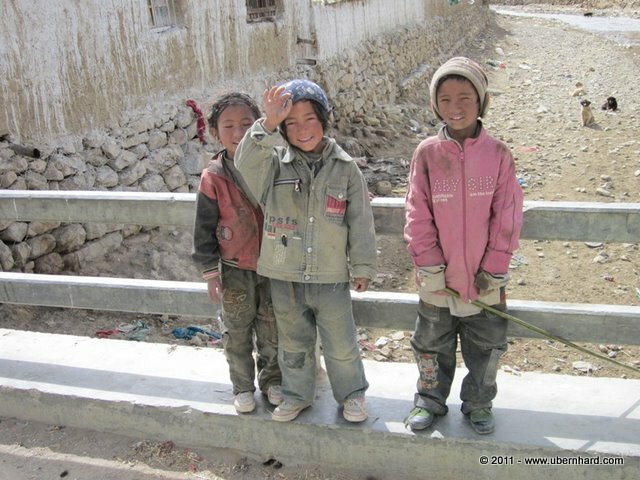 The next morning, on April 14, we left Thingri around 8:50am and drove first for about 68 km/42.5 miles on the main road towards Lhasa through a beautiful high desert, crossing a few Tibetan farmer villages along the way. Then, after about an hour drive came the turn towards Everest. The sign showed 102km/64miles to Everest Base Camp. This was now a winding dirt road and after about another hour we reached the high point of the Pang La pass at 5,150m/16,995ft. 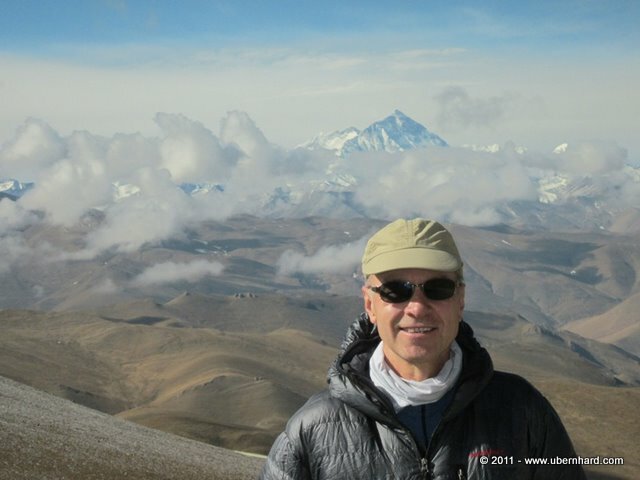 We stopped at top and took some pictures of Everest and Cho Oyu. It was a fabulous view from up there and we were excited to move closer and closer to our goal: Everest Base Camp. 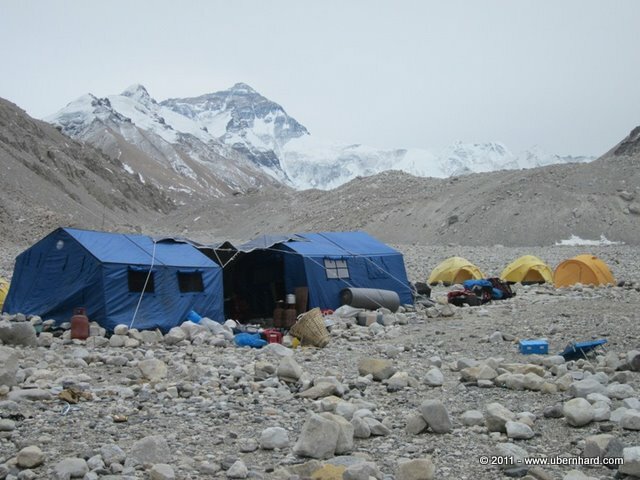 After about another three hour drive through dry valleys we finally arrived at the Base Camp. There were only a few expeditions here so the place looked rather empty. 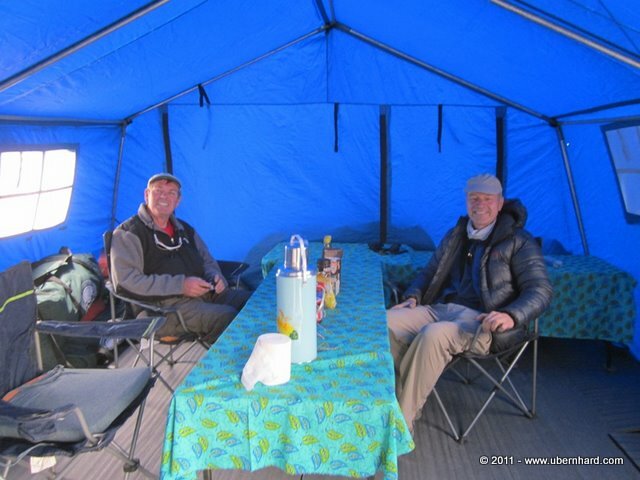 The good news was that our camp was already set up we were welcomed by our Sherpas Phnuru, Pasang and Rames with a warm tea and great lunch. They had left Thingri a day earlier to set up the camp. After this nice refreshment we started to move into our tents, unpacked our equipment and enjoyed the great view of Mount Everest. 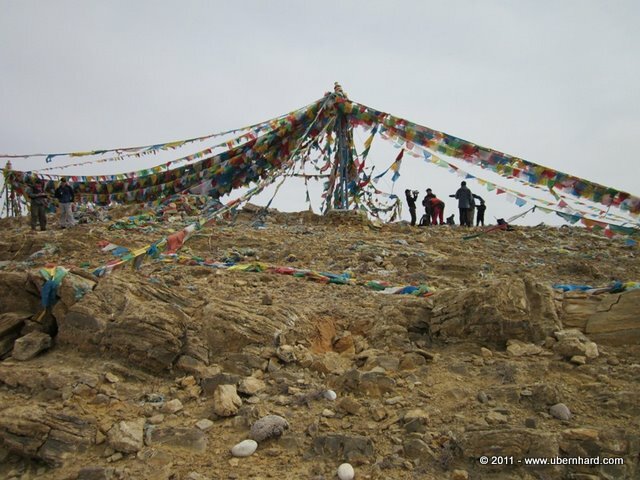 Finally, we had arrived at our expedition starting point: Chinese Base Camp at 5,200m/17,160ft.